(Left to right): Joan Pritchett, Director of Four Oaks Chamber of Commerce, Tim Barbour, Four Oaks Chamber Board President, Megan Lee, Teachers Lead Recipient, Missy Medlin, David Pearce, SJHS Principal. The Four Oaks Chamber of Commerce has selected Megan Lee the November Teacher of the Month. 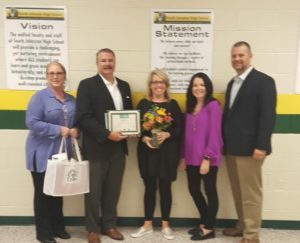 Ms. Lee was presented with a certificate of recognition as well as a bag of gifts from many of the Chamber member businesses during a visit at South Johnston High School.